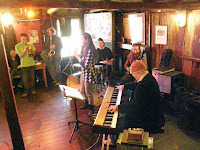 It was a drink with Megan and some mates rather than a listening session, but I thoroughly enjoyed Aron Lyon, Bill Willams and Ed Rodrigues playing Sunday afternoon at the Belgian Beer Cellar in Kingston. Dave Rodriguez has built up a busy schedule of weekly bar gigs for his trio, but he’s gone off to Europe and Aron’s filling in. This is a standards gig, but the tunes are not too obviously played. There’s a real complexity, a constant, rich interaction between the players and musicality galore. The bass line is anything but pedestrian, with interesting, responsive lines alternating through syncopation and fast and steady walks. There are also the prescribed lines where required: Bill’s bass lines on Round Midnight were spot on and I’m sure I’m heard them before. Perhaps it was a transcription exercise. Aron’s lithe and fluent with a thin, sharp tonality rollicking over the rhythm section. Ed’s drumming is gentle and responsive. There are plenty of solos all round, but equally the accompaniment playing is richly improvised and strongly interactive. The tonality is stated, but it’s subtle. The tonics and fifths don’t always sit on the 1s and 3s. The melodies pass through and over the bar lines. The comping is melodic, diatonic, but rambles freely from the tonal centre, to imply tonality rather than declare it. There are implications of soft, Bill Evans fluidity in all this. This is sweet, complex, rewarding music, and it revives your love of the standards repertoire. 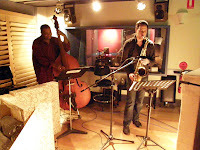 The trio is playing at the Belgian Beer Cellar in Kingston each Sunday afternoon. The beers are luxury (I don’t recommend the one with fresh cherries, but they say you should try everything once) with prices to match, but entry is free. 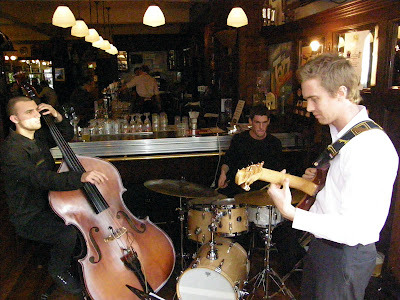 The trio also play other venues each week. 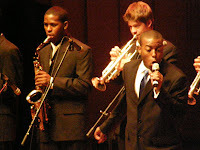 Check out the CJCalendar under Dave Rodriguez Trio. Really lovely stuff. The Stax Academy Band visited Canberra today and brought a touch of Memphis soul and popular music history. 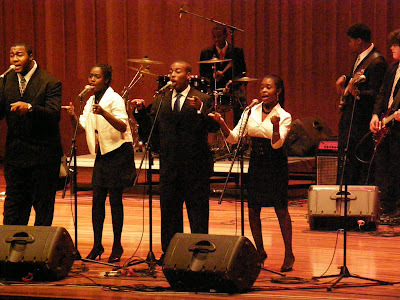 It’s a great era of black pride, luscious grooves and powerful, gospel-infused voices. Stax was a famous record label of the period. It’s now closed, but the premises are used for an academy (sounds to me like a high school/college in Canberra terms) with a music theme, and serving a local inner-city community. In the words of the promo, “the Stax Music Academy … uses music education as a tool to mentor primarily at-risk inner-city youth”. Honourable work, and the result is good, down to earth, entertaining music. The Stax Museum of American Soul Music is also associated with the Academy. Looking at the brochure for the Museum, I can see that Memphis is a place to add to your tour. There’s the Stax Museum, but also Gracelands down the road, Sun Studio, a museum to Rock’n’roll and the National Civil Rights Museum. Interesting. The band played with verve and enjoyment. 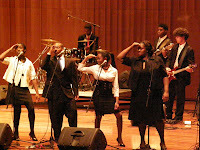 In the black soul tradition, there were strong voices, dance routines, infectious rhythms, horn lines and the like. The tunes are mostly ones you recognise even if you can’t put a name to. They also did a tribute to Australian music, which was a bit incongruous and not particularly soulful, but it went down well. It was a medley with tunes by ACDC, LRB and others, and of course the inevitable reggae-ish “Land down under”. The music was infectious, but sadly, Canberra didn’t do it justice. Llewellyn Hall is a BIG space, and it needs a decent PA for amplified music like this. It provided one that would be more than adequate for a bar or wedding (perhaps 500W per side) then proceeded to mic drums, bass, guitars, horns, vocals, the lot. There was also no foldback in front of the main vocal mic, but maybe they were monitoring in-ear. I missed most of the horns and keyboards, vocals got lost amongst a heavy, muddy rhythm section, and I even struggled to hear some lead vocals. The bass and bass drum must have sucked up most of the power when they kicked in. The problem was obvious, and it was a topic of conversation in the foyer after the concert. It wouldn’t even cost that much to fix: a few more wedges and more powerful, full-range front-of-house speakers (and a decent PA tuning job) is probably all that’s needed. I don’t envy the mixer fighting with the inadequate equipment. Sad; we can easily do much better. But it’s well known the music school is skint. 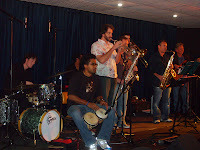 But the concert was fun, the players were keen and the music infectious. Thanks to the US Embassy for sponsoring the tour. It’s a nice bit of cultural promotion. They are not the top players (it is a school band, after all) but they are enthusiastic and perfectly capable, and the tour serves both performers and the audience, and the music makes such great memories. Nice one. 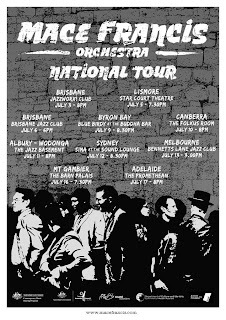 MFO is the Mace Francis Orchestra who will soon be visiting Canberra on tour from their distant home, Perth. Introducing the MFO is the title of one of the CDs Mace sent me. And it’s good. It’s exciting to see that ensembles like this are booming around Australia. Sadly, they are expensive to tour, so we tend not to have too many as visitors, especially from as far away as Perth. This opportunity is coming thanks to various government sponsorships (including from “soundtravellers”, a project of the Australia Council). Mace Francis is Lecturer in Arranging and Composition at the Western Australian Academy of Performing Arts (WAAPA). He also composes, arranges and leads the MFO, a jazz orchestra of 12+1 players in the style of Maria Schnieder and the like. This is capable playing, and the charts are richly arranged and so sound sweet. The music is variously pensive or dramatic, sometimes explosive (Where’s his sepcin?) or even threatening (I thought horror movies in Lemon Water). The orchestration is complex and rich, and Mace obviously enjoys the sounds of the various parts interwoven or moving in sheets of textures and colours. There’s also comfort with time, with a few odd time signatures from the rhythm section and frequent difficult syncopations amongst the various horn parts. And the band does its bit with good tight, well-intoned ensemble playing. Mace also sent me a live recording made at Bennett’s Lane in 2006 when they toured the Wangaratta Festival and the eastern states. 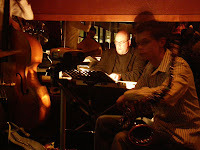 This included several tunes by alto player Dan Thorne, so the band’s not limited to Mace’s writing, as well as tunes by Thad Jones and Mingus. Moanin’ by Mingus was typically ecstatic and featured that lovely baritone sax sound along with shouts of encouragement and hand claps as befits Mingus. Apparently, the band has extended its repertoire to play charts of key big bands in jazz history, so perhaps we can expect a bit of a history lesson when they visit. Looking forward to the opportunity of hearing another Jazz Orchestra, especially from such distant shores. 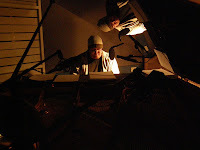 MFO appear at the Folkus Room 8pm, Thurs 10 July. $15/12. Recommended. It’s been a string of opportunities to hear Wayne Kelly before his departure. The last was Sunday afternoon at the Old Canberra Inn. 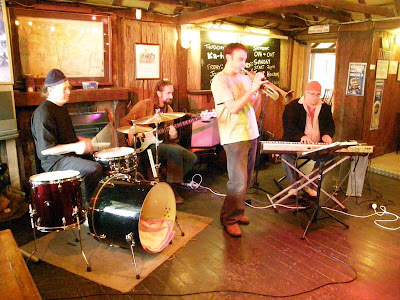 The Inn is mainly a blues venue, but it’s relaxed and genuinely old with its timber slab walls, so good for a get-together of jazzers as well as an easy-going jam session. Wayne had been inviting people to this farewell session so there were lots of friends to join in, some unusual combinations to form, and some new names to meet. The host band was Wayne with James Luke and Wayne’s brother Gavin on drums. James was playing his usual busy, playful style across a range of musical forms. Great playing from a local bass identity. Wayne was similarly spirited as he worked his way through blues and jazz and funky rhythms. Gavin played a laid back blues style and was obviously enjoying the outing. John Mackey and trumpeter Dan McLean sat in, along with Fedoran vocalist Angela Lount. A later combination took names from the local blues stable. 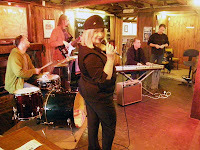 Gaye Reid led a band with James Luke, Chris Thwaite on drums, Leo Joseph on piano and Chris Tomasyk on blues harp. 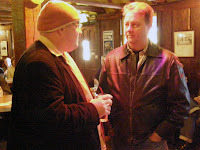 There were several pianists there on the day who might take some of the work passed on by Wayne. Paul dal Broi didn’t play, but John Black was about to get up as I left (“too drunk to play, but not drunk enough to know it”). I understand my mate Daniel Wild got in a few choruses on piano before I arrived, too. I got the call from James Luke to sit in, so got to play a few tunes with John Mackey, Gavin Kelly, Jim Latta and Wayne. It was solid swing and I was adjusting to a different instrument, but I played OK and got in one solo which was a bit extravagant (not inappropriate for such a session). Off to the side, I could hear a cavalcade of notes from John working his way through (pre-)Coltrane changes on the bridge of Have you met Miss Jones. Good fun. 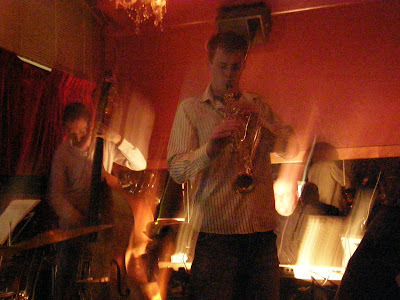 Niels Rosendahl was there too, although sadly without his sax. He’s just recently returned from London. Such is life; we come and we go, I guess. 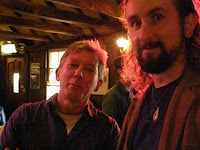 It was a poor showing at the Folkus jam session this month, despite having James LeFevre’s interesting and involving band as host. Folkus will need more interest and support if it’s not to go the way of the sadly missed White Eagle. So, form your jamming groups and come along. Perhaps try to organise a jam band for an upcoming session using CJ on Facebook. Whatever, get along and support this initiative. I arrived late, so missed most of James’ set. What I heard was worldly, relaxed and inventive. Kane was missing on bass, so Ben had a doubly demanding job having to cover the bass lines on piano, but even so it was comfortable and capable. 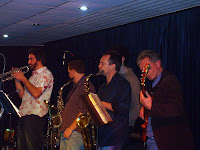 The band will be playing for JazzGroove in the next few months, and they’ve described themselves thus: “original material drawing upon a smorgasbord of influences encompassing Jazz, Dance, Blues, Funk, Latin, Hip Hop and gypsy music of the Balkans … characterised by its contrast of intricate, extended arrangements with open, loose blowing sections”. Nicely put. No wonder I like it. Kooky Fandango also did a short set. They impress me as having a pure, light, precise tonality. 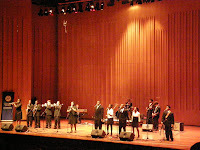 Their music is a mix of jazz and latin, and even some blues at times, and is precise and flowing and open. Peter plays a hugely clear tone on his 6-string Alembic (Series 1, no less! 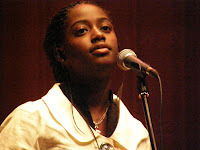 ), and even takes on a guitar-like accompaniment role at times, and I think that’s part of the open sound. They play a sweet and pleasant, but grooving and interesting music; just perfect with white wines on a warm Sunday afternoon. I got to play a few tunes, initially with James’ band, then with the addition of the horns from Kooky Fandango and a nice bongo player for a solo and some additional rhythmic complexity. It’s easy to play with such trained players; it all just falls together. I especially enjoyed Evan Dorrian on drums. He offered smiles of encouragement along with some very smooth drum solos that were very clear expressions of the underlying tunes. I also noticed how James worked as a leader. Having a leader can really pull things together. He’d just casually lean over and say a few words like “sit on that”, and the form of the piece just fell into place. Nice one. I think the next session will have original music from Dan MacLean and I’m hoping for my Toucani to be there for a short set. Looking forward to it already. Get out and support Jazz @ Folkus. 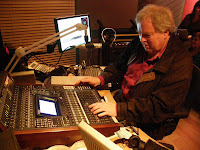 Wayne Kelly took control of the studio at ArtSound for this week’s Friday Night Live. It was pretty much the last opportunity to hear Wayne before he departs for a stint at the Venetian Macao, a 5-star resort/casino. I checked out the website. The Venetian is one of those mock-casino affairs, with its own Ponte Rialto and Campanile. But then, given that the original Campanile di San Marco collapsed in 1902 and the current replacement was completed in 1912, perhaps we can think of Macao’s version as almost as authentic. The entertainment is similarly impressive, with Cirque du Soleil bookings now open. We’re losing our local master pianist to the commercial glitz, but I’m sure he’ll do a great job in good company. 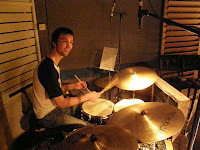 Wayne will be playing with local Jazz School graduates drummer Nick McBride and bassist Scott Dodd and a US sax player. Back to the studio. Wayne played two sets of original tunes that he had penned, and he’d gathered an excellent quartet to perform them: Eric Ajaye, Con Campbell and Sam Young. Eric arrived with minutes to spare after his regular gig at the Kurrajong. He was in top form with his smooth, glissando-rich, driving style and melodic solos. Con Campbell is a Jazz School graduate from the time when the school was at Manuka, in the very buildings currently used by ArtSound. He’s now based in Sydney and the experience shows. There were some expressive melodies and he let go for some blaring and harmonically adventurous solos on the up pieces. Sam was tight and swinging and kept a watching eye on the others throughout. He took a few solos too, passing around choruses on swing or taking charge against repeated motifs in a more modern style. If you know Wayne’s CD, you’d recognise several of the tunes. 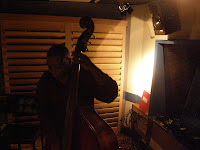 There was hot swing (Dr Kirkland blues, So what’s the number), afro-latin grooves in a modern jazz setting (For the time being), arabic scales (King of kings), ballads (Mt Conder, Alone, In my quiet hour). There were also several stylish dedications to pianists: one was a quirky Monkish piece named for the time it was composed (1st of Feb 2004, 3.35 A.M.); others were obvious from the titles, hard swung Dr Kirkland Blues and sweetly melodic Mr Hank Jones. This was a strong set of satisfying compositions that Wayne has built up over the years. 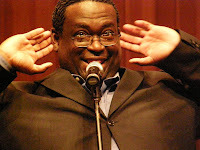 Wayne introduced the sets with tongue-in-cheek humour in the jazz style. 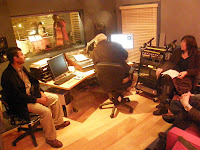 There was restrained laughter in the studio at times, and good and satisfied thanks all around at the end of the session. 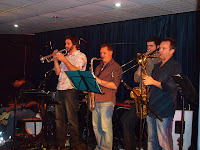 This was a good natured crew, and the comfortable but challenging playing just brought out the good will. Best of luck to Wayne for this adventure, and thanks for the excellent broadcast. And remember to check out ArtSound if you’re free on a Friday evening. 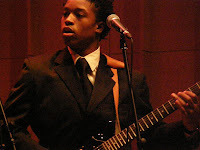 Eric Ajaye has a broadcast coming up in August, and many of the best student bands are playing over the coming months, as well as local live recordings from the ArtSound collections and some European concerts. We had London visitors last night at Hippo when Duncan Eagles and Max Luthert visited and played with some of our locals. London seems a mythical distant place at times and Duncan spoke with a lovely accent that reminds you of other places. 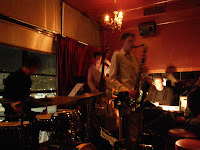 But the language of jazz is universal, so it’s no surprise that the conversation on the night was capable and pleasing and the tunes mostly recognisable. Apparently, Duncan had met Bruce Hancock, head of jazz studies at Adelaide’s Elder Conservatorium, when he was visiting London. Bruce invited Duncan to Australia and helped him find players for his visit to Adelaide although I’m not sure who they played with there. The travellers also visited Melbourne where they played with Ben Vanderwaal and heard local masters Sam Anning and Jamie Oehlers. Hereabouts, CJ helped them to find a double bass to borrow (thanks to Simon Daly at the Violin Shop) and players to perform with. They are off to Sydney next, not to play but to absorb the scene. The essence of good travel is to meet the locals, so jazz tourism like this is a great way to travel. They were enjoying it, and were talking of the next time. 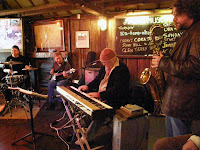 The visitors teamed with Wayne Kelly and Sam Young on the night. They started with Softly as the morning sunrise, then Sam River’s Beatrice, so it was looking to be a comfortable evening. 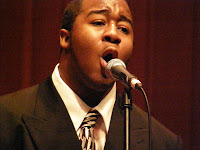 Duncan warmed up over the night to play with passion and a great fat tone on his black and gold tenor. Earlier on, he seemed more restrained, but later he turned to flurries and screams. He also picked up soprano for one or two tunes; these more melodic rather than extravagant exploits. Max was in the know, so set the stage for new tunes. He played a few solos, but concentrated on his support role of walking and other lines. Wayne started from the top with rich harmonies and constantly changing improvisations to glances of approval from the visitors. Sam played with comfort and reliability, but also with considerable authority. I especially noticed very clear statements in fours as they were passed around the band, but he was confident enough to leave space behind heads and elsewhere. Otherwise, it was ballads, bebop, bossa. Wayne looked very concentrated on a few tunes – perhaps originals or otherwise lesser known. Similarly, Sam was sometimes reading accents, but other times relaxed and just grooving. In all, it was a satisfying evening of mainstream/modern playing. 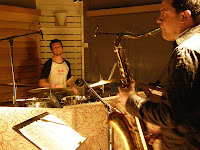 Londoners Duncan Eagles (tenor, soprano sax) and Max Luthert (bass) played with Wayne Kelly (piano) and Sam Young (drums). CJ now has a group on Facebook. 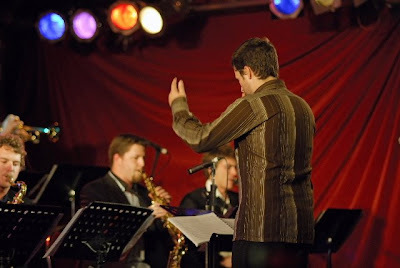 This is a place for the Canberra Jazz community to gather, share ideas, news and the rest. Find fellow players or followers of jazz. Keep in touch with those names you used to know. Find new friends with similar interests. Follow the link to "Group (Facebook)" in the menu on the CJ home page, or otherwise search for the group "Canberra Jazz" in Facebook. You have to be a Facebook member, so you may need to join. But do take part ... the community's growing strongly with 85 members as I write this, including outposts in Finland and London. Join up now. It’s getting so that Miro’s and John’s bands are becoming like old friends or family. You recognise the tunes and the performance styles are established. When they play with different people or arrangements, you can listen for the interpretations that change, and that’s a real fascination. It’s leaning to classical music, where all the notes are written, so the interpretation is even more subtle. In the case of jazz, the melody and groove will be set, but even they are twisted in interpretation on the night, and the improvisations are much more varied. 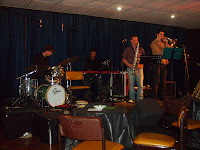 Miro’s quintet played the other night at the Band Room at the Jazz School. It’s a nice location: quiet, interested, a listening audience, lots of like-minded attendees, and you can get a beer in the breaks. Miro, of course, was leading and provided several of the tunes, mostly well known ones from the Wanderlust songbook. John also provided several tunes which I recognised from his CD, Pantano Drive. But what especially interested me were the different approaches and tonalities and interpretations of this band as against, say, Wanderlust. Wayne was far more Tyner-ish than is Alister Spence. Mark was less latin than Fabian Hevia. Not better or worse but quite different. And the sound of woodwind in place of brass as a second instrument was also a change from Wanderlust. So the tunes are the same, but the experience is different. For covers, they performed Joe Henderson’s Afrocentric and Zawinul’s Directions (apparently claimed by Miles, as was Bill Evans’ Blue in Green). Miro also led a wonderful ballad called “Peace please”: quite beautiful, and dedicated this night as a “hymn for our time”. To note was an alto solo by John. I don’t remember hearing him on alto before. Chris continues to impress, including with that walk on Pantano Drive at breakneck speed, and some modern, syncopated bass lines on other tunes. I also noted some powerful montuno playing by Wayne that just grabbed the band and drove it. It’s not something I’d noticed in his playing before. And there’s news about Wayne: he’s off to Macao to play the casinos in a few weeks. Good pay, good conditions. We’ll miss his playing around town, but should be a great opportunity. Best of luck from CJ. It was a terrific night, with the infectious melodies we know from Miro, and great playing in a style more than usually reminiscent of that heady period of the early 60s. At least for the next few weeks, the Miroslav Bukovsky Ensemble comprises: Miroslav Bukovsky (trumpet), John Mackey (tenor, alto sax), Wayne Kelly (piano), Chris Pound (bass) and Mark Sutton (drums). 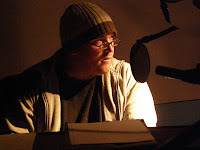 Alpha is for the soft and lyrical ballads, played with acoustic tones and cut times. Omega is for the breaks into frequent cacophonies and occasional free jazz which were often such vivid developments on the alpha themes. Three omegas is for the three amigos, mates, that got together to play this music that was such a unique mix of bitter and sweet. To me, the Three omegas played a deceptive set: unexpected and unusual in its approach and intent. David plays with a sharp, tangy, unadorned overtone-rich sound on his semiacoustic. We expect sweet, Django, and we get some lovely ballads played with lyrical interpretations, and with a level of soloistic shape which a guitarist friend was raving about. Similarly with the others. Mike is also clear and sharp in his tone, and can be melodic in his bass playing, and James had a tonality that I loved on a large snare and a deep floor tom that sounded as if he fell into the skin. There were some pure melodic solos from David and Mike, but, then, gradually, all this melody devolved into cacophony; growing, growling, held at a level of extreme tension for some minutes. I didn’t time it, but this was not restrained! This was full descent into abyss stuff. Bass and guitar strumming, with form delivered from tripletted drums which may have been solo, may have been structured, or may have just been there. But it gave some stability until the band gradually returned to order, to better understood vistas. This was the first time, but the night continued thus. Pretty melodies, sweet tunes, devilish cacophonies, occasional free play, tunes again... And other than one standard (Django’s “Castles of my dreams”), these tunes were compositions by the band. Not surprising. It was an interesting conception: an unusual one and very engrossing. Sets moving over extremes of tension: alternatively sweet or tense, always protracted. Here pure, sweet melodies; there descents to madness and excess. The show had this changing shape of one to the other, almost unnoticed until it was on you. Nice one. 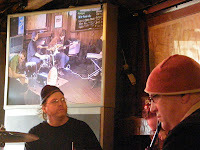 The Three omegas are David deVries (guitar), Mike Majkowski (bass) and James 'pug' Waples (drums). I had to make a choice last night. 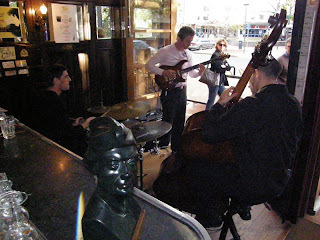 Was it jazz at the Gods with Bob Bertles? Truly that was something I rued missing. But the other god was better known, I’d booked months back, and I couldn’t stand my wife up, so “Keating! the musical” it was. I missed a visit to Sydney’s El Rocco of the 50s, but I caught a fabulously entertaining musical ride through 90s current affairs. You’d have to have been there (the 90s, that is) to really enjoy it. But for those with an eye for politics (I have), and doubly so for those with despair during the Howard years (me again), it was a night of frequent and satisfying belly laughs. The show started with a five piece band on stage, playing the Beatles’ tune, Glass onion. Glass onion has the quote “the walrus was Paul”, so we’re on track from the start. The band was relaxed and obviously enjoying themselves, so looking good. Bob Hawke started the show, and various snippets of the history of the Keating years followed: the promised handover, the rolling of Hawke, the defeat of Hewson in ’93, the Gareth and Cheryl romance, right up to Keating’s defeat by Howard in ’96, although strangely this was portrayed with historical revisionism as a loss for Howard. There were memorable quotes that popped into the capable, theatrical singing. The “banana republic” had its own song, but I missed “the recession we had to have”. But “do you slowly”, “things that batter”, “light on the hill”, “it’s time” and many others made appearances. The whole show was a series of songs in various popular styles: mambo for Mabo; disco for an outrageous Rocky Horror Downer scene; a fabulous rap battle between Hewson and a verbally triumphant Keating. The music was varied, and the band performed it with comfort and occasional changes of instruments: guitar/alto sax; electric/double bass; piano/accordion; and even some acting and singing roles. Keyboardist Gareth making out with guitarist-with-blonde-wig Cheryl was amusing (“My heart’s in peril, Cheryl … Heavens, Mr Evans”). There were even a few (very few) slightly poignant moments. The final Keating ode to a bright and brilliant future lost to a Howardian past of relaxed suburban comfort was the closest to tragedy for the night. But I couldn’t bring myself to laugh at the truly withering scene of Howard as a small, embittered man with militaristic tendencies, accompanied by a warriors’ march. Megan wondered if there could be a similar creation for Howard. We decided it was unlikely. Keating was so colourful, leaving aside a large potential audience of sympathetic arts-loving theatre-goers. I couldn’t imagine the battlers at “Howard! the glory years” sometime in the future (perhaps a sitcom on commercial TV?). But maybe it’s just too recent, and the wounds are too raw. A few years of Rudd may have us thinking differently. I loved the music, the humour, the lighting. Great show. See it if you can, at least if you’re old enough to remember the period. It’s a hit for good reason. In the meantime, check out the summary of the show on Wikipedia. 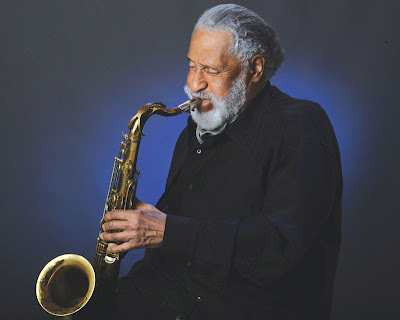 I didn't get to Sydney for the Sonny Rollins concert, but I know others who did. Tell us how you found it. Just add your comments below.